Restoration is a term used in dentistry to describe the repair of a missing or damaged tooth structure. Restorations are classified as either direct or indirect. Direct restorations are repairs made inside of the mouth (fillings), while indirect restorations are fashioned outside of the mouth and then affixed to either the tooth or the supporting tooth structure in a separate procedure (examples include veneers and crowns). What is appropriate for you depends on the issue you're facing, but your personal preferences may also be able to play a role in your decision making. With direct dental restoration, all of the work is fabricated and completed within the mouth. The procedure, commonly referred to as filling, involves the placement of a malleable substance into a prepared and cleaned cavity. The material is then hardened to restore the structure (and sometimes appearance) of the damaged tooth. Silver amalgam is a compound consisting of 50 percent mercury and 50 percent silver, tin, zinc, and copper. The advantages of silver amalgam include low cost, easy installation, and exceptional strength and durability. On the downside, it is not aesthetically pleasing and is prone to expansion and contraction. This may cause a tooth to crack, or allow food and bacteria to become trapped and promote decay. The use of mercury also remains controversial. Composite fillings, made of synthetic resins, are extremely popular because they can be matched to the shade of your tooth. However, they are far more expensive than silver amalgam fillings and less durable, requiring replacement every five years or so. Glass ionomer fillings are created by mixing silicate glass powder and polyacrylic acid to form a hardened, cream-colored bonding agent. The fillings are relatively weak and mainly used on baby teeth and non-biting tooth surfaces. On the plus side, they are moderately priced, do not shift or contract, and contain fluoride-releasing compounds that can prevent tooth decay. Another form of direct restoration is direct dental bonding. This refers to the procedure in which a putty-like bonding agent is used to repair cracks, reshape teeth, or reduce gaps between teeth. The bonding agent is shaped and tinted to match the optimal aesthetic of the tooth and then dried in your mouth with a curing lamp. With indirect dental restoration, the fabrication occurs outside of the mouth. Examples include veneers, crowns, bridges, implants, inlays, and onlays. While some people will refer to dentures as a form of indirect restoration, the term usually applies to a permanent or semi-permanent dental fixture rather than a removable one. Because the procedures require more work (such as a dental impression, tooth preparation, fabrication, and a temporary veneer, bridge, or crown), they tend to be costly. On the upside, they can increase the aesthetic appearance of your teeth or provide a more stable, longer-lasting solution when the damage is severe or extensive. Veneers, also known as indirect dental bonding, are thin shells of porcelain that can replace or cover the enamel of a damaged, stained, or misshapen tooth. They are manufactured using an impression of your teeth and are especially desirable because their color and translucency mimic your natural tooth enamel. Dental crowns, also known as dental caps, are appliances that completely cover the surface of a tooth. They are typically bonded to a prepared surface with dental cement, which improves both the strength or appearance of a tooth. Crowns may be made of metal (such as gold or titanium), ceramic (such as zirconia, silica, or alumina), or a metal-ceramic composite. Bridges are artificial teeth that are affixed between real ones to fill in a gap where teeth have been removed or are missing. The natural teeth that support the bridge are called abutments. A bridge may either be fixed (joined to two abutments), cantilevered (joined to one abutment), or adhered (cemented to adjacent abutments). The bridge is typically made of porcelain, metal, or porcelain fused to metal (PFM). 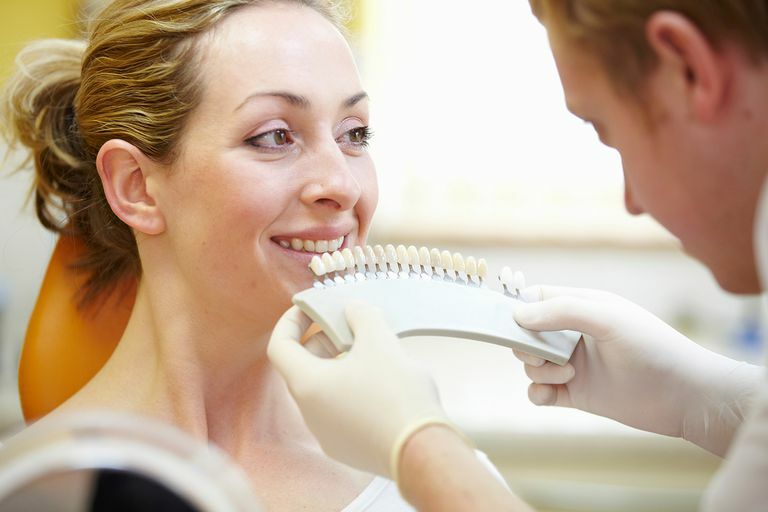 Implants are dental appliances that are surgically fixed into the bone of the jaw. The implant may be used to support a crown and bridge. The procedure can often require several steps to create a temporary prosthetic, extract the damaged tooth, prepare the implant site, manufacture the permanent prosthetic, and affix the implant. Once completed, it can take three to six months for the new bone to form (ossify) around the implant and secure it into place. Inlays are similar to fillings but, rather than using malleable materials, are created from a dental impression using porcelain, gold, or a resin composite. The molded inlay, which mimics the appearances of a natural tooth, is then cemented into place. Inlays are less prone to shrinkage than fillings and are usually indicated when decay or a fracture is extensive. Onlays are more extensive versions of inlays. Rather than restoring an area of fracture or decay, an onlay would replace any bits of tooth that have broken off. An onlay differs from a crown in that it only covers part of a tooth, not the entire thing. Moncada, G.; Silva, F.; Angel, P. et al.Evaluation of Dental Restorations: A Comparative Study Between Clinical and Digital Photographic Assessments.Operative Dentistry.2014;39(2): E45-E56.DOI: 10.2341/12-339-C.